Companies that need an app for their business be it restaurant app or complicated IoT solution in the energy sphere. Any situation fits the business reality, and every idea deserves to be taken into account. However, we are talking about business. The world where every decision costs money. So, one of the best things you can do during the planning process is to conduct a SWOT analysis. 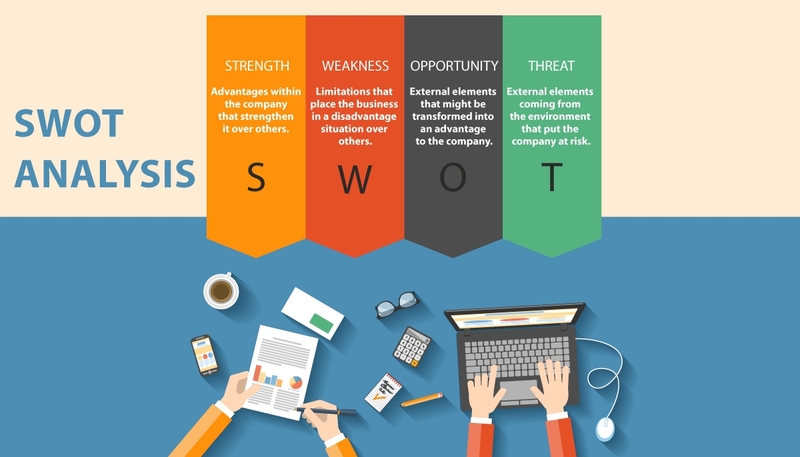 SWOT is an abbreviation that has become a proper name. The word stands for strength, weaknesses, opportunities and threats. Basically, it is an analytical framework that helps to create the whole picture, analyze the situation and find the best solution. The best thing about this tool is that it identifies not only internal but also external influences. I have no doubt that you have heard about this method. However, I also know for sure, that most of us ignore it while planning or simply don`t implement it correctly enough to take the real advantage. In this article, I`m going to guide you through all niceties of this process so that you could analyze your mobile app idea before starting app development process. There is one thing that you need to understand about SWOT analysis. It does not necessarily offer a solution. However, it helps to find and analyze key issues affecting your idea or business. SWOT is not a universal solution, so note main advantages and limitations before conduct one. You can reveal the most competitive strength and exploit opportunities. SWOT is not a cure for all diseases of your business; it is just one though critical step of your business planning. Note, that it only covers issues on strength, weakness, opportunity or threat. That is why it is not applicable for more complicated and uncertain problems and factors that could either are strength or weakness or both. Some produced by SWOT information is useless. Before getting started, you need to define the objective of your analysis clearly. You can do SWOT on your business, idea, MVP (minimum viable product) or some particular characteristics of the product. Now you need to do some in-depth research on your industry and the market. You can get information not only from the web, but also from your staff, business partners, and clients. There is an important Tip for you to remember. Strengths and weaknesses are often internal. Meanwhile, opportunities and threats refer to external factors like market and competitors. First of all, think about all characteristics of you app idea or the business that require an app. Part of this list will hopefully be a strength. Also, try to look at your strength concerning your competitors. If any players in the market have the same characteristics that are to be defined as strength, for your business it becomes a necessity, not a forte. What advantages does your idea or business have? What unique selling proposition do you have? What does your app do better than anyone else? Are there any unique resources you can draw upon? What is the final goal that you define as a sale? At this step, you are to be realistic and brave enough to face the truth. There is no limitation for the perfection. That means that you can always find weaknesses to improve. Compare your weak sides to your competitors` ones and try to analyze how they deal with same challenges. What improvements could you bring? What do your users consider as a weakness? What characteristics of your product do negatively affect your sales? Catch a clue for this stage. Look at your strength and think how you can turn them into new opportunities. Also, analyze your weaknesses carefully and think how you can improve them for new opportunities. You can find new opportunities everywhere. Follow up trends and technologies in your local market and international one. Don`t forget about government police monitoring and observing your potential user's lifestyle and behavior patterns. What trends and technologies can you implement? What weaknesses of your competitors can you use? What opportunities can you get when scaling your idea? Both for threats and opportunities it might be useful to implement the PEST tool. It helps to analyze your business environment for political, economic, social-cultural, and technical changes. It also gives you a big picture for the further planning. What are difficulties you might face? How do your competitors overcome threats? How do quality standards influence your mobile app or idea? Will your mobile app be ready for changing technologies? Have you made sure that you will not have funding problems? 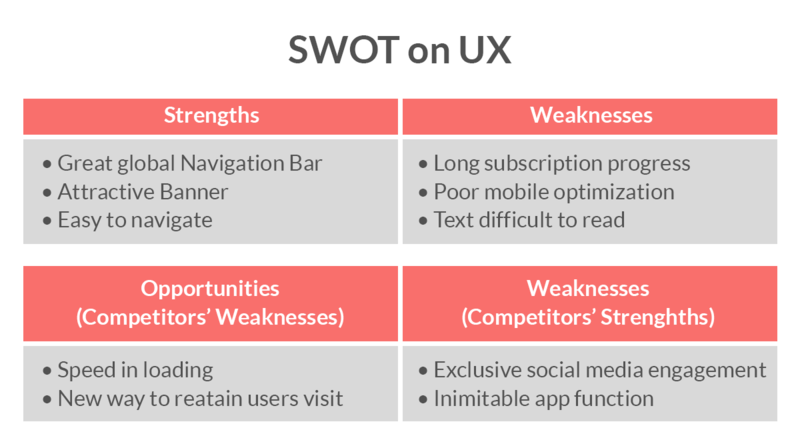 As I told you before, you can implement SWOT analysis not only for your idea or existing app but also for more specific things like user experience. In this case, you better not to seek for a help of your friends and family. UX requires an honest feedback from the real users of your app. The importance of analytics and planning is difficult to overestimate. SWOT analysis is one of the handy tools that can improve your product and processes at every stage of your product`s lifecycle. This framework helps to rethink the strategy and understand your competitors. Use only reliable information and precise statements. Get rid of the obvious information and prioritize the rest. Apply characteristic at the same level and don`t mix the specifications. For example, don`t use idea`s strength in SWOT on UX, etc. To get a more comprehensive feature, use the analysis in a mix with other analytic tools like PEST Analysis, USP Analysis, Core Competence Analysis and so on. You can also apply for a help of our business analytics. He will assist you to conduct the deep analysis and determine the next steps. Please, contact our manager to set up the meeting.